Form I-765 is an application for employment authorization. Employment authorization is when United States Citizenship and Immigration Services (USCIS) gives temporary authorization for employment to non-citizens. Certain immigrants who qualify to work in the United States can use Form I-765 to request an employment authorization document (EAD). 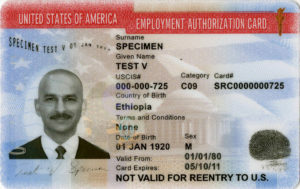 This document grants the non-citizen temporary employment authorization in the United States. Are approved to work in the United States due to your immigration status (asylee, refugee, or nonimmigrant) and need evidence of that employment authorization. pending Form I-485, Application to Register Permanent Residence or Adjust Status. pending Form I-589, Application for Asylum and for Withholding of Removal. a nonimmigrant status that does not allow you to work in the United States without first seeking permission from USCIS (such as an F-1 or M-1 student). You do NOT need to apply for an EAD if you are a lawful permanent resident, conditional resident, or nonimmigrant. Your Green Card provides sufficient proof of your employment authorization. You also do NOT need to apply for an EAD if you possess a nonimmigrant visa that authorizes you to work for a specific employer (for example, an H-1B, L-1B, O, or P visa). What supporting documents do I submit with the form? Your application with the filing fee. A copy of your last EAD (front and back). If no prior EAD has been issued, you must submit a copy of a government-issued identity document, such as a passport showing your picture, name, and date of birth; a birth certificate with photo ID; a visa issued by a foreign consulate; or a national ID document with photo and/ or fingerprint. The identity document photocopy must clearly show the facial features of the applicant and the biographical information. If you are filing under the (c)(33) category, additional documentation is not required. Supporting document upload is included with SimpleCitizen. What is the Form I-765 processing time? The I-765 form processing time takes up to 90 days, at which time you are guaranteed a response from USCIS. What is the Form I-765 filing address? If you’re filing the form directly, the address depends on the eligibility category you entered in Question 16 of Form I-765. If you are filing I-765 with another form, file both documents at the location required by the other form. Use the addresses found on the USCIS website only when you are not submitting I-765 with another form. How much is the Form I-765 filing fee? If you submit the Form I-765 with an immediate family based green card application (Form I-485), then the fee is automatically waived. If you’re filing the Form I-765 separately, the filing fee is $410. You must also pay an additional $85 biometric services fee, for a total of $495. Can I get a fee waiver for I-765? Your household income is at or below 150 percent of the Federal Poverty Guidelines. Check the current Federal Poverty Guidelines for this year to see if your household income qualifies. You are currently experiencing financial hardship that hinders you from paying the filing fee, such as unexpected medical bills, emergencies, and other unforeseen circumstances. You may file for a fee waiver by filling out Form 912 (Request for a Fee Waiver). There is no filing fee for this form. You cannot file online if you are requesting a fee waiver. You will need to file paper versions of the fee waiver request and the form for which you are requesting a fee waiver, together. Do not file the two forms separately. Each person applying for a fee waiver must sign and date the Form I-912. Instead of filing Form 912, you may also file for a fee waiver by writing a letter with all the necessary information that states your request for a fee waiver, is signed by everyone requesting the fee waiver, and includes all the necessary supporting evidence. For further information on proof of documentation and eligibility, check the USCIS Fee Waiver information sheet. How do I renew my I-765? Is there an I-765 renewal fee? If your EAD has expired or will be expiring soon, you can submit a new Form I-765 and filing fee (unless a fee waiver has been requested and granted) to file for a renewal EAD. Do not file for a renewal EAD more than 180 days before your initial EAD expires. How do I request a replacement EAD? You may follow the renewal process listed above to request a replacement EAD for lost, stolen, or destroyed documents. If your EAD contains incorrect information that is not due to a USCIS error, you must submit a new I-765 form, a filing fee, the required documentation, and the card containing the error. If your EAD contains incorrect information that is due to a USCIS error, you do NOT need to submit a new I-765 form or a filing fee–USCIS will process your replacement request at no cost. In this case, you must send the original card containing the error, a detailed written explanation of the card error, and supporting documentation on the correct information. Submit this information to the service center or National Benefit Center that approved your latest Form I-765. What if my documentation is in a language other than English? Any document containing foreign language must be accompanied by a full English language translation which the translator has certified as complete and accurate. You must also include the translator’s certification that he or she is adequately able to translate from the foreign language into English. Certified document translation is included with SimpleCitizen. Do I recieve updates when USCIS has accepted my Form I-765? Yes. To do so, fill out Form G-1145 (E-Notification of Application/Petition Acceptance) and attach it to the first page of your I-765 application. Remember to sign your form! USCIS will reject and return any unsigned form. Biometrics Services Appointment: After receiving your application and ensuring completeness, USCIS will inform you in writing when to go to your local USCIS Application Support Center (ASC) for your biometrics services appointment. This appointment is to gather physical data by which a person can be uniquely identified. At your biometrics appointment, USCIS will collect your fingerprints, take your photo, and have you sign your name for electronic capture. If you do not attend the appointment, your application may be denied. Form I-765 is included with SimpleCitizen. What is the Form I-765?